theatre of noise: What illuminates the night? Alpha 5: What is the privilege of the dead? Johnson: To die no more. Alpha 5: Do you know what illuminates the night? Alpha 5: What is your religion? Johnson: I believe in the inspirations of conscience. Alpha 5: Do you make any distinction between the mystery of the laws of knowledge and the laws of love? Johnson: In my opinion, there is no mystery of love. From Alphaville, une étrange aventure de Lemmy Caution, 1965, written and directed by Jean-Luc Godard with texts from Capital of Pain by Paul Eluard. 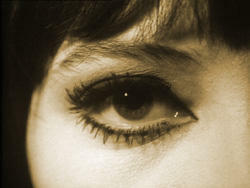 The image shows Anna Karina as Natacha Von Braun. I cleaned it up from a screen grab. This eye now stares out at me from my desktop, but I think it is too much to bear. Alphaville is my movie of choice. I come to your blog from the lands posterior when I went looking for what illuminates the light.